At The Killino Firm, our cases are the news. From The Philadelphia Inquirer to The New York Times to major legal publications, our cases have been featured in major news stories throughout the country. When the lawsuit we filed against Chinese tire manufacturer Hangzhou Zhongce Rubber Company forced its American importer to recall over 450,000 light truck tires, The Legal Intelligencer, Philadelphia’s daily legal newsletter, featured The Killino Firm’s efforts as the top news story because our case was the reason for the massive tire recall. This recall may have prevented countless injuries and deaths on our highways. Read the full Legal Intellencer story. 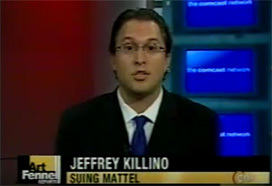 When we filed a class action lawsuit against Mattel to force the toy manufacturer to pay for testing of children at risk of lead poisoning from its toys, The Legal Intelligencer again featured The Killino Firm, as its top news story because our case was the news. We make the news because we are dedicated to assuring that our clients, and every American, can feel safe and secure when buying tires, playing with toys, and using the many items we take for granted in our daily lives. Read the full Legal Intelligencerstory. Please feel free to click on one or more of the links below to read one of the many other articles that demonstrate how The Killino Firm is Keeping America Safe. When the Internet was still in its infancy, say in the long-ago past of 2006, the rules governing evidence in most civil cases were limited largely to paper. A Philadelphia attorney filed a lawsuit Monday against Tyco Healthcare on behalf of the family of a Missouri man who died after allegedly suffering adverse reactions to tainted heparin that originated in China. A Philadelphia law firm filed suit yesterday against the health-care company Covidien Inc., alleging that it had supplied tainted doses of the blood thinner heparin to a Missouri retiree who died as a result of allergic reactions to the drug. A Philadelphia attorney filed motion in federal court to stop an Arizona tire dealer from selling 3,500 tires that may be part of a recall of Chinese-made tires announced earlier this summer. He says the episode underscores how potentially dangerous tires sometimes continue to be sold long after they were meant to be pulled from the market. A lawsuit filed by a Mattel Inc (MAT.N) shareholder on Wednesday contends the world’s largest toymaker misled investors by failing to report serious defects in its toys. Toy giant Mattel Inc. was blasted in Congress on Wednesday for failing to detect the recent flood of lead-paint contamination in Chinese-made Barbie dolls, Thomas and Friends train sets and millions of other toys. Democrats and Republicans alike accused Mattel of negligence as the House Energy and Commerce consumer protection subcommittee convened a two-day hearing on tainted toys. Two Fontana parents have filed a class- action lawsuit against toy maker Mattel for selling dangerous toys. The suit, filed Aug. 20 in Los Angeles County Superior Court, blasts Mattel for selling toys made in China that contained lead and magnets that could fall off and choke small children. A family sued Mattel Inc. yesterday, claiming the world’s largest toy-maker should pay for testing to determine if children have been exposed to lead from millions of recalled toys. From dog food to toothpaste to Sponge Bob, it seems everywhere you turn lately there is another bad product imported from China. Connecticut Sen. Chris Dodd, D-Conn., wants a moratorium on imports of Chinese food, toys and pet food. And, Rep. Rosa DeLauro, D-3, has called for quick federal action to insure products are safe. A lawyer filed a suit against Mattel Inc. because of recent recalls of toys made in China that might have contained excessive amount is seeking class-action status. When Mark Lanier, a liability lawyer in Houston, took the case of a 6-year-old girl who choked to death on a toy, he tried suing everybody in the supply chain: the fast-food restaurant that sold the toy in a children’s meal, the American importer and the toy’s Chinese manufacturer. Toy maker Mattel Inc was sued on Monday in an attempt to force it to set up a fund to pay for testing children who may have been exposed to lead poisoning from its toys, according to a Los Angeles-based attorney. The attorney, Jeffrey Killino, said a family in Los Angeles is the lead plaintiff on the case, but added he is seeking class-action status for the case. Jeffrey Killino filed suit on behalf of several Philadelphia families in May in Common Pleas Court against Foreign Tire Sales, a North Jersey tire distributor, alleging that its Chinese-made tires caused a crash in August that claimed the lives of two Philadelphia construction workers and severely injured another. When The Killino Firm signed on to represent victims of a fatal car accident, they initiated a 9 month investigation into what caused the driver of the van to lose control, killing two passengers and seriously injuring the third. When you need a lawyer who will exhaustively investigate your case and make sure that every responsible party is held accountable, contact The Killino Firm, where Keeping America Safe is our primary goal. To speak with one of our attorneys, call us toll free at 877-875-2927, or click here to send us an email. We will respond promptly to your inquiry so that you can experience The Killino Firm Difference.